Bolivian Thoughts opinion: The world must know, Bolivia is in the verge of losing its democracy! The Constitution that the same coca grower caudillo imposed has been trashed, for the solely purpose of remaining in power. This delusional ruler, has relentlessly pushed to get re-re-re-re-elected. He is a demagogue, a bitter individual that has brought corruption to public office, unseen in previous governments, for the magnitude and numerous cases, across the public sector. 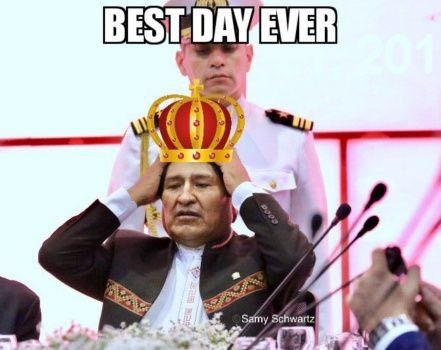 The Constitutional Court ruled in favor of a citizen, Evo Morales, and against more than 2.7 million Bolivians who voted in rejection of the possibility that the current president of Bolivia could be a candidate in the 2019 elections. In February 21, 2016, when the sovereign was consulted in a referendum, 51.3% voted against repostulation, compared to 48.7 that approved that possibility. The Constitutional Court modified the Magna Carta of the Plurinational State, declaring the inapplicability of articles 156, 168, 285 and 288 and the unconstitutionality of several articles of the Electoral Law. In this way, the possibility of Evo Morales being authorized for a fourth re-election and for others, if he so decides, is approved, because any legal limitation for this purpose is eliminated. The performance of this court sets a disastrous precedent for democracy and the supreme law, which is the largest agreement of coexistence in a country. By modifying the Political Constitution of the State at the request of a political party (the MAS), it opens the way so that any other article of the Magna Carta can be changed, through a resource presented by an interested sector, although this goes against of the majority will of the citizenship. In recent weeks, President Evo Morales questioned what he calls “western democracy” (in which there are majorities and minorities) and praised what he has labeled as “communal democracy” (which is applied by consensus and ignores minorities). It would be worrying if a next step of changing the Constitution advances in that line. On the other hand, the ruling of the Constitutional Court ignores the voice of the sovereign people, privileging the political right of Evo Morales and ignoring the value of the result of the suffrage that, in theory, is the highest authority of a democratic State. They are not encouraging news for democracy in the country. This entry was posted in Bolivia, Politics, Social Unrest and tagged corruption in public office, demagogue, democracy in peril, illegal, police and judicial corruption. Bookmark the permalink.